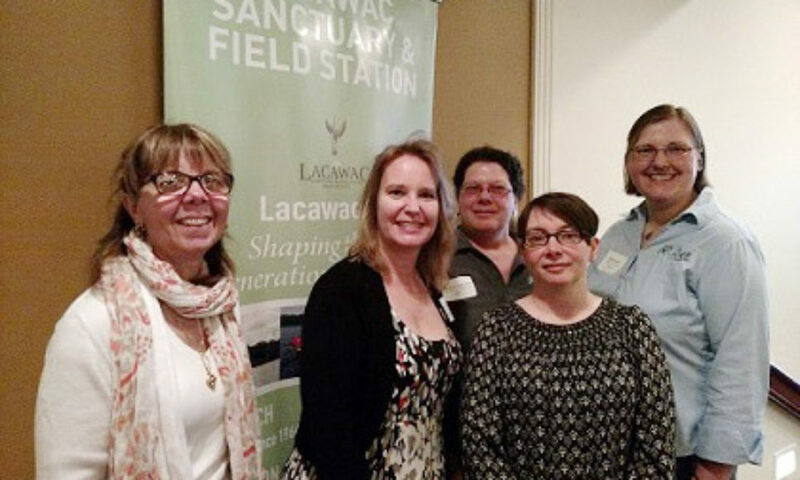 Pike County Conservation District was a proud supporter of the 2015 Women in Science Symposium hosted by Wayne Pike Workforce Alliance (WPWA) and Lacawac Sanctuary and Biological Field Station. Held at Ehrhardt’s Waterfront Resort on May 27, this unique forum showcased the professional and life experiences of distinguished female science and environmental leaders. Through stimulating conversations and active engagement with STEM (Science, Technology, Engineering, Math) professionals, this symposium encouraged women to pursue careers, exchange ideas and make lasting connections. Conservation District Executive Director Sally Corrigan and Senior Resource Conservationist Ellen Enslin were in attendance and were highlighted in a video clip. Resource Conservationist Marianna Quartararo and Administrative Manager Michele Ulmer also attended. Photo from left: Sally Corrigan, Michele Ulmer, Marianna Quartararo, Kelly Stagen and Ellen Enslin.